College District, the largest community college district in the nation. 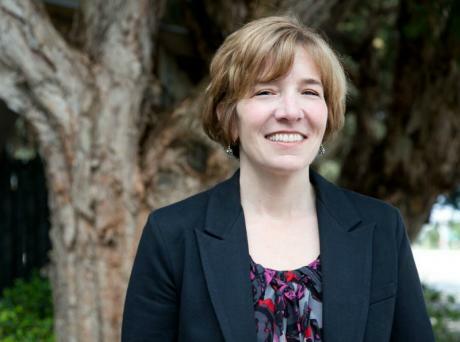 Join the UC Center Sacramento on WEDNESDAY, August 9th at noon for a lecture by Professor Heather Bullock, from the Psychology Department at the University of California, Santa Cruz (UCSC) and Director of UCSC’s Blum Center on Poverty, Social Enterprise, and Participatory Governance. Professor Bullock will speak on “The ‘Hidden Injuries’ of Childhood Poverty: The Impact of Class Stigma, Stereotypes, and Bias”. This presentation explores how low-income children are affected by the “hidden injuries” of class (Sennett & Cobb, 1972). The CMB Summit Series is an annual workshop designed to bring top scholars to UC Davis to discuss an important, emerging aspect of minds and brains. The upcoming summit is organized by the UC Consortium on the Developmental Science of Adolescence with a focus on Adolescence as a Second Period of Transformation. 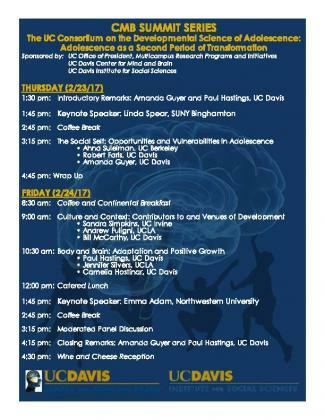 The workshop features keynote talks by Linda Spear (SUNY Binghamton) and Emma Adam (Northwestern University) as well as talks by several scholars of adolescence from across the UC-system. The University of California Center at Sacramento (UCCS) advances the University’s mission of teaching, research and public service with an integrated program to train future state leaders, to address challenging public-policy issues confronted by the nation and state, and to carry out the University’s mandate to assist state government. Located one block from the State Capitol Building, UCCS offers events and seminars, as well as distinctive academic programs in public policy and public-affairs journalism to students from throughout the university’s 10-campus system. These programs provide students with an opportunity to study through seminars and internships in and around the state Capitol.